This summer, several members of Priory’s science faculty spent time off campus experiencing new labs, gathering data in the field, and finding incredible opportunities to bring back to Priory for their students. Mr. Bander, Mr. McLaughlin, Mr. Orlando and Mr. Wenger shared their summer experiences with us. This summer, I participated in a PaleoTrek expedition. 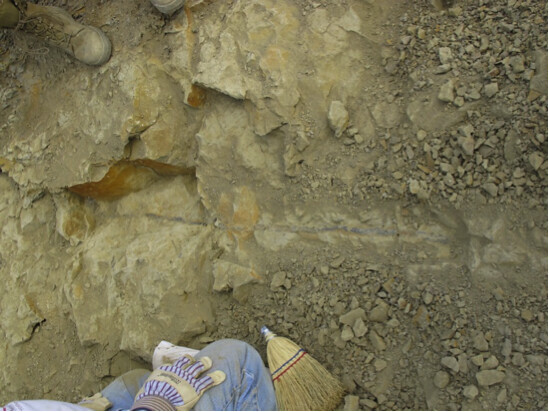 I, along with students and educators from various schools, went to Jordan, Montana to dig for dinosaur fossils. We had extremely good luck this year and ended up finding more fossils than we could transport out of the Montana Badlands. Many of the larger finds (rib bones, skull fragments, etc.) will have to be processed through the Museum of the Rockies before they can be loaned out to Priory for educational purposes. However, smaller finds (gar scales, turtle shells, champsosaurus teeth, dromaeosaur digits, fossilized plants, etc.) have already been cataloged and added to Priory’s fossil collection in the science department. They will be used for various labs and demonstration in the Junior School science curriculum regarding paleontology in the 7th grade geology course and comparative anatomy in the 8th grade health science course. At the end of the 2014-15 school year, I flew to Minneapolis, MN in late May to attend the National Science Teacher’s Association’s 4th STEM Forum and Expo. At this conference, science teachers from all grade levels (mostly K-12, including some higher education) across the country came together to discuss, demonstrate, and share best teaching practices; particularly those lessons that seamlessly incorporate several major science topics within the context of a particular course. The philosophy behind STEM (Science, Technology, Engineering, and Math) lies in both getting students to see the connections between seemingly disparate subject matter both within and outside of science, and allowing students to realize these connections by providing authentic opportunities for discovery. While at the conference, I met with veteran biology, chemistry, and physics teachers who showed me unique ways to incorporate discussions of solid state materials (plastics, ceramics, composites, etc. ), corrosion and redox, polymer science (with heavy emphasis on bioplastics), nanoscience, and molecular modeling with 3D printers into the everyday curriculum. Locally, I ventured down the road to Washington University for additional STEM workshops in late June and early July offered by Photosynthetic Antennae Research Center (PARC) with an emphasis on renewable energy. While there, I had the opportunity to work on nuclear chemistry labs with actual decaying samples, engineer a photobioreactor (or at least the beginnings of one), detect various microbes using spectroscopy, visit the Champ Landfill to see methane collection and redistribution from waste, and tour the Alberici Construction facility, a LEED (Leadership in Energy and Environmental Design) certified green building. I am excited and overwhelmed with the amount of ideas I have from the conference and the seminar series! I look forward to working several of these ideas into my courses and to creating more opportunities to enhance science literacy at Priory. This summer I attended the Midwest Zebrafish Conference at Washington University. Having conducted research in developmental genetics and neuroscience using the zebrafish as a model organism, I am now exploring using the zebrafish as a tool for teaching biology. Over the past two decades the zebrafish has slowly become the premier model organism for studying vertebrate biology, especially genetics, and is currently the most easily genetically manipulated vertebrate used in biomedical research. In fact, it has become so popular that scientists now hold regional, national, and international academic meetings about progress being made in the field. The regional meeting at Washington University showcased some of the most cutting-edge research being conducted using zebrafish in fields from molecular genetics, to developmental biology, to neuroscience. While at the meeting, I was able to connect with local scientists who are enthusiastic about engaging in community outreach in the form of education. As a result, I have been fortunate to work with researchers at Washington University to get my zebrafish lab at Priory off the ground. With this new lab, I will be able to guide students through experiences focused on analyzing genetic, anatomical, and behavioral aspects of the fish as well as standard lab practices used in genetics labs such as DNA extractions and PCR genotyping. Also, through this meeting, I was able to organize a trip for my summer neuroscience class to visit one of the leading Alzheimer’s disease labs in the world, an experience that they will surely not forget! This summer I worked at Washington University, helping develop lab experiences involving genetics for teachers involved in a Masters of Science in Biology Program. Our labs included using PCR and DNA sequencing to identify bacteria and a lab synthetic biology in which the students moved and modified promoters in the expressions of genes. I also instructed two labs in energy and energy transformation, one on the production of biodiesel and the other on the generation of hydrogen gas used to run fuel cells by using solar energy. I also attended several lectures presented by various professors on cutting-edge topics and research that included alternate energy, transposons, synthetic biology, epigenetics, and metagenomics. This summer I also attended a daylong workshop on genetic barcoding at the St. Louis Science Center. Finally, I participated in several meetings of the Washington University Evolution Education Book group.